If you have a pressure washer and want to apply a thick layer of foamy suds to your paint, the DI Accessories Speedy Super Foamer will allow you to do so with ease! Just fill the reservoir with any shampoo, connect it to your pressure washer and spray foamy soap anywhere you want! Once applied the soapy foam will start to break down and loosen dirt and grime for safe, scratch-free, removal from the paint. The longer the shampoo remains on the surface, the longer it has to lubricate and break down contaminants. When using a regular two-bucket wash method the shampoo tends to run off the paint quickly. If you have a garden hose, the Gilmour Foamaster II Foam Gun helps enhance your foam, which extends the amount of work time it has on the surface. But what if you are looking for even more foam and an even longer work time? With the DI Accessories Speedy Super Foamer, just pour your favorite shampoo into the reservoir, connect your pressure washer and start spraying foam on the exterior! This Foam Lance will help produce a thick coating of foam that stays on the exterior and does not readily run off. This gives the shampoo a longer work time to loosen and help remove even stubborn dirt and grime. You can use this Foam Lance with virtually any pressure washer that is between 700 to 3000 PSI with a standard connection. The various spray patterns help you coat your vehicle in suds just the way you like. The adjustable intake allows you to also play around with the amount of foam created, meaning you can go from a thicker stream to a more diluted stream of foam with only a simple turn of a nozzle. The Speedy Super Foamer takes your washing to a new level! If you have a pressure washer we strongly recommend the DI Accessories Speedy Super Foamer because you'll have a lot of fun washing your vehicle while improving your results! Note: The Speedy Super Foamer is designed to work with the majority of pressure washers, but it is not compatible with the DI Accessories Karcher K Series Foam Lance Fitting, or Karcher pressure washers. If you have a Karcher pressure washer, we recommend picking up the DI Accessories Foam Lance, the DI Accessories Foam Cannon, or the DI Accessories Featherweight Foam Cannon and the DI Accessories Karcher K Series Foam Lance Fitting. No Pressure Washer? If you do not have a pressure washer, we recommend using the Gilmour Foamaster II Foam Gun. This unit will not produce as thick of a layer of suds as the Foam Lance or Speedy Super Foamer, but it will work with any standard garden hose. Works great. Produces lots suds and when you change the nozzle to fan it's really wide. Priced good as well. This foam lance works great. I have a 2000Psi electric washer. Makes good amount of foam. Excellent quality made from brass. 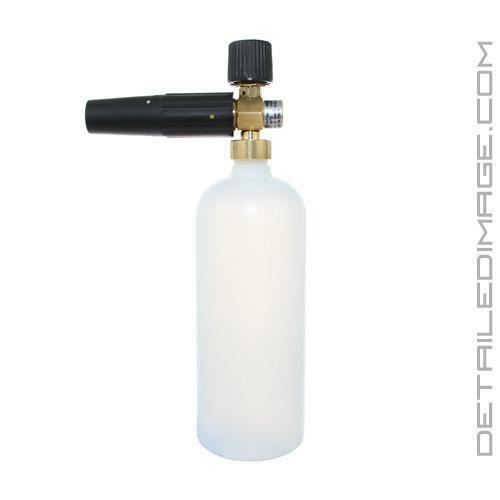 Adjustable spray and a dial for the thickness of foam. Easy to use, connects to my pressure washer easly.